Ruby Lena’s Tea Room & Antiques is one of the favorite restaurants in Branson where locals and visitors alike want to enjoy awesome food and antiques in a nice ambiance. Beautifully located at West Main Street in the Historic Downtown Branson, this unique restaurant offers guests a charming and elegant yet casual dining experience in a beautiful setting adorned with vintage décor and stylish table dressings. 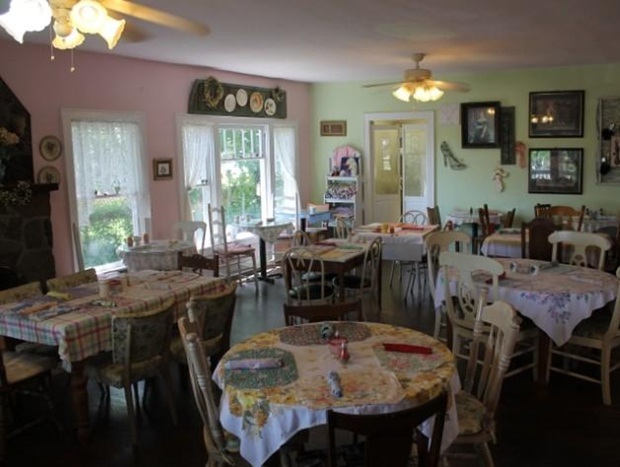 At Ruby Lena’s Tea Room, you can choose from eclectic menu selections including chicken and dumplings, chicken pecan quiche, chunky chicken salad, cold strawberry soup, Broccoli & Cheese Soup, Chicken Salad Croissant, and Reuben sandwich as well as delicious desserts such as coconut cream pie, lemon icebox pie, and coconut cream cake. Many of the regular customers coming to this great dining spot love the restaurant’s chilled soups and their dessert specialty, big slices of pie. You’ll also find delicious sandwiches and salads and tastier tea room fare you expect that is served with a unique hospitality in the Ozarks. With so much to see and enjoy in downtown Branson, you’re sure to become hungry after a full day of activity, so why not grab a quick snack or a delicious meal at the charming Ruby Lena’s Tea Room & Antiques. Beautifully located in a darling house in downtown Branson, the lovely Ruby Lena’s Tea Room offers classic lunches in an old-time atmosphere. The owner of this lovely dining place, Bobbi Helms says the restaurant serves good lunches and will give you a memorable dining experience. Her light recipes and homemade desserts are served in a Victorian-country setting, which are perfect for coffee and conversations. In this restaurant, there’s more than just food, you’ll find antiques that range from delicate china to tea sets, jewelries and dolls. At Ruby Lena’s, it’s great to relax and enjoy casual conversation with friends at the quaint tea room that serves unique combinations such as peach tea complimented with a delicious slice of coconut cream pie. So don’t miss to visit Ruby Lena’s and enjoy the taste of the legendary coconut cream pie. In addition to pie, the Tea Room also offers a wide selection of menu of homemade quiches, sandwiches and desserts. You won’t regret visiting the place, as you will enjoy every second in this charming atmosphere because you will find yourself surrounded with antiques and unique gift items. This unique and quaint dining spot is nestled on a descending hill that leads to one of the most popular shopping destinations in the Ozarks, the Branson Landing. Ruby Lena’s Tea Room might be a small eatery but it’s overflowing with great displays of antiques. Vintage photographs and framed antiques fill the walls, as a frequent diner, you can’t help but think of what a perfect venue this tea room would make for a wonderful conversation with friends. Many of the restaurants in Branson always offer delicious food but Ruby Lena’s not only offers awesome food but also antiques and a quaint tea room perfect for conversation.